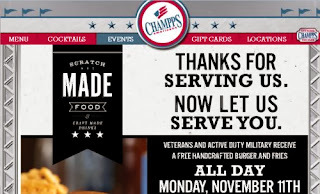 Free Champps for Veteran all day Monday November 11th, 2013. Thank you for your service now Champps serves you for ree all day! Click the link below to go check out the delicious menu to chose your meal from.